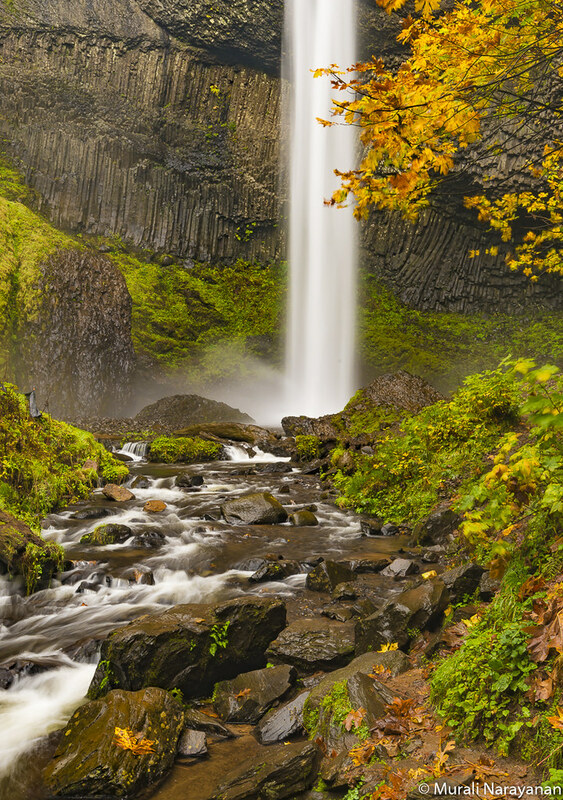 Last October, 4 of us did a 2-day trip to the Columbia River Gorge area to experience the fall colors around the popular waterfalls along the Oregon side of the river. Here is a sampling of images along with location information, and photography tips. We left Redmond, WA at 8am and after a brief stop along the way to grab coffee, we reached Troutdale, OR, the gateway to the Columbia Gorge area, just after noon. Along the main drag of the town were a number of cozy restaurants. We decided on Italian and walked into Restorante Di Popello. The food and service were both excellent. After lunch, the first stop was at the Portland Woman’s Forum Scenic Viewpoint (used to be called Chanticleer Point) on the Historic Columbia River Highway just east of the town of Corbett. 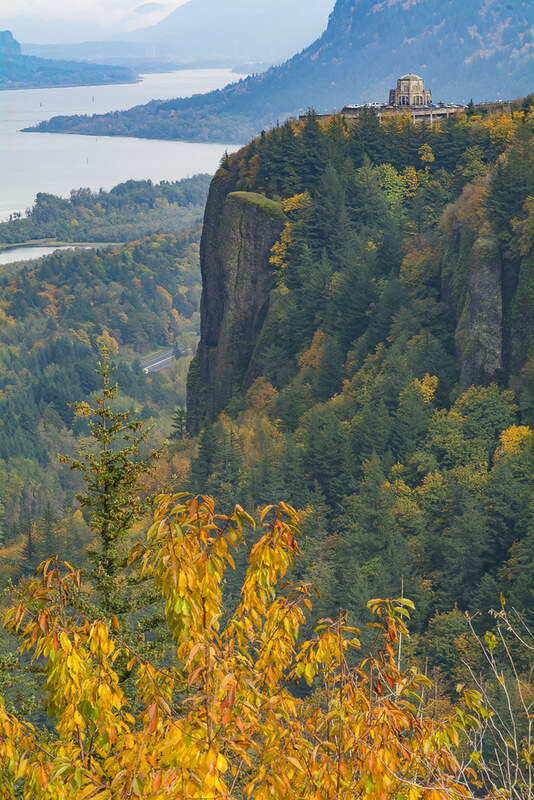 The viewpoint offers spectacular views of the Columbia River Gorge and Crown Point/Vista House. The view was terrific but the lighting was harsh and not optimal. Sunrise is a much better time to visit this spot. I used a heavy dose of Dehaze filter in Lightroom CC to bring out the fall colors in the final image. 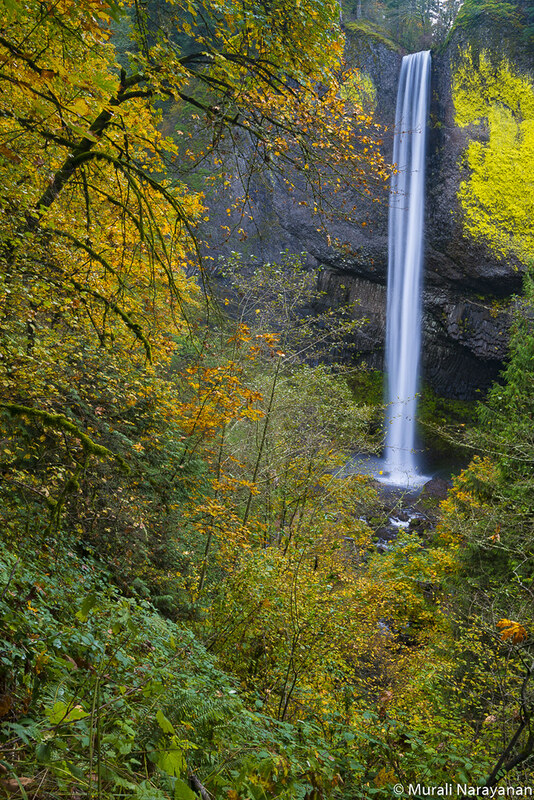 Latourell Falls is the first waterfall to be experienced along the Columbia Gorge Scenic Highway. Because of this, it usually leaves quite an impression on first time visitors. 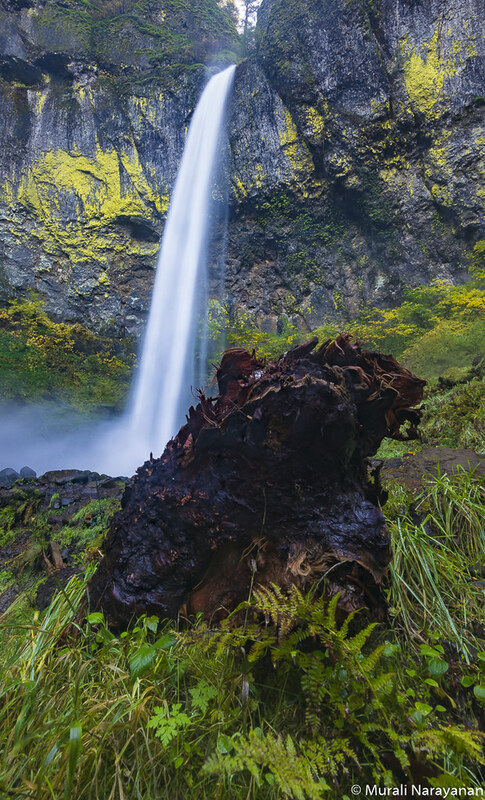 The falls plunge 224 feet over a massive wall of columnar basalt – some of the best formations in the Pacific Northwest – before cascading towards the Columbia River. The accents of the large patch of neon yellow lichen growing next to the falls and the fantastic columnar basalt formations behind the falls make the falls really photogenic. There are 3 good spots to shoot the falls with lots of possibilities at all of them. The shot below is from the right end of the parking lot. 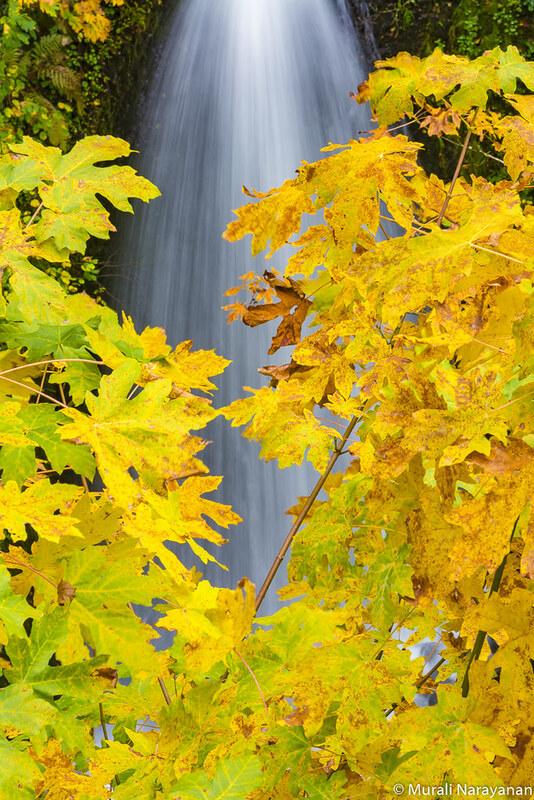 You can use the autumn leaves to frame the falls from this spot with 50-60mm lens on a full frame camera. If you are in a hurry and don’t have the time to smell the roses, this is where you want to shoot from. The second spot is about 200′ up the slope from the parking lot to the left of the viewing platform. From this spot, I felt the best optimum focal length to use is 35mm on a full frame camera. You can use the trees to frame the falls as shown below. 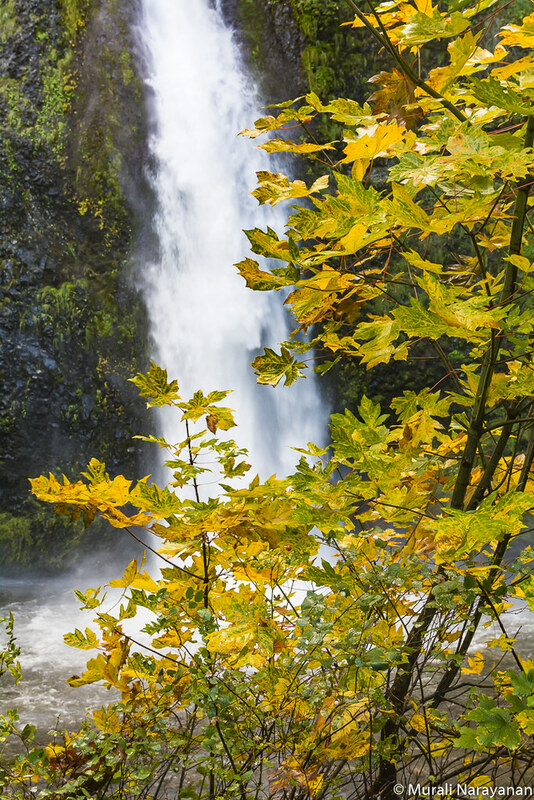 The fall colors in the gorge area had not peaked during the 3rd week of October last year (2016). Last week in October or first week in November would have been a more optimal time. 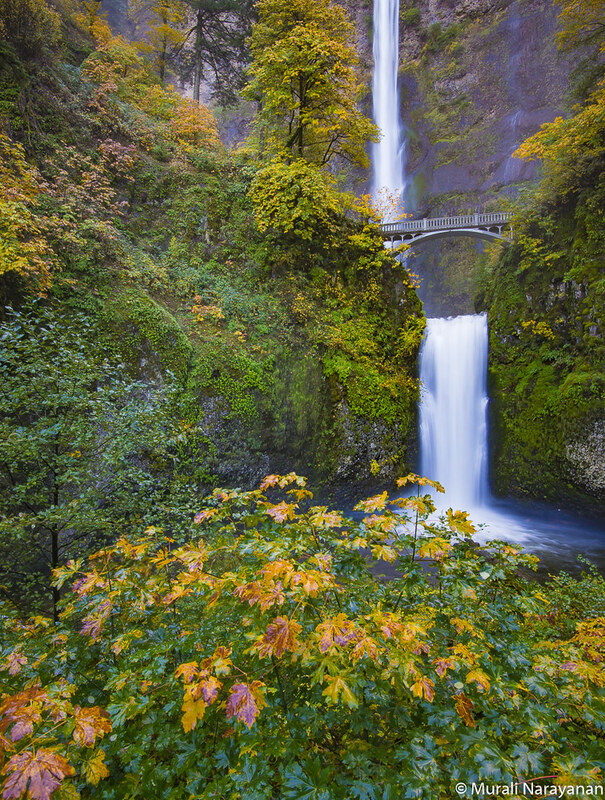 Check out the Oregon Fall Foliage website for up to date information. The third spot is to hike down to the base of the falls from the trail head to the right of the parking lot. The hike to the base is short and I estimate the distance is about 0.3 miles with an elevation loss is about 70′. You can cross a small bridge in front of the falls and you have terrific views from either side of the bridge. 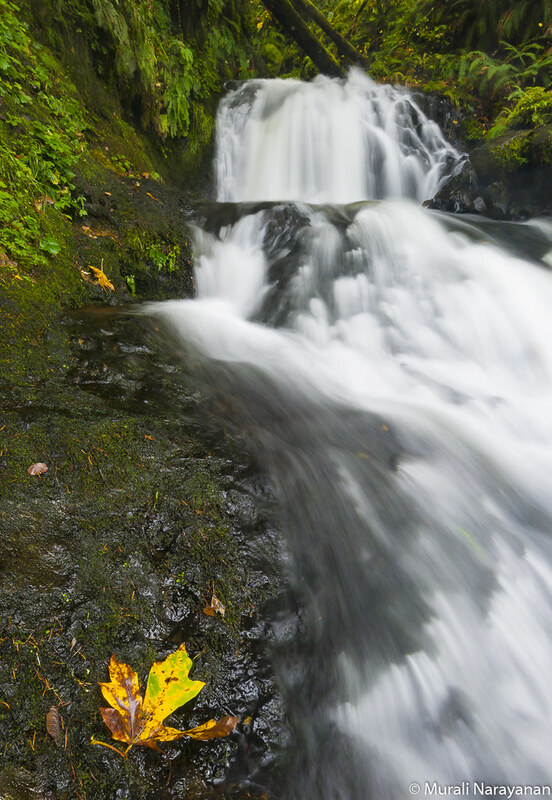 The next stop was at a smaller and lesser popular falls, the Shepperd’s Dell Falls. Although parking is limited to 3-4 cars, it is not a major issue as most people skip it. I have had no issues with finding parking here after visiting it 6 times over the years. 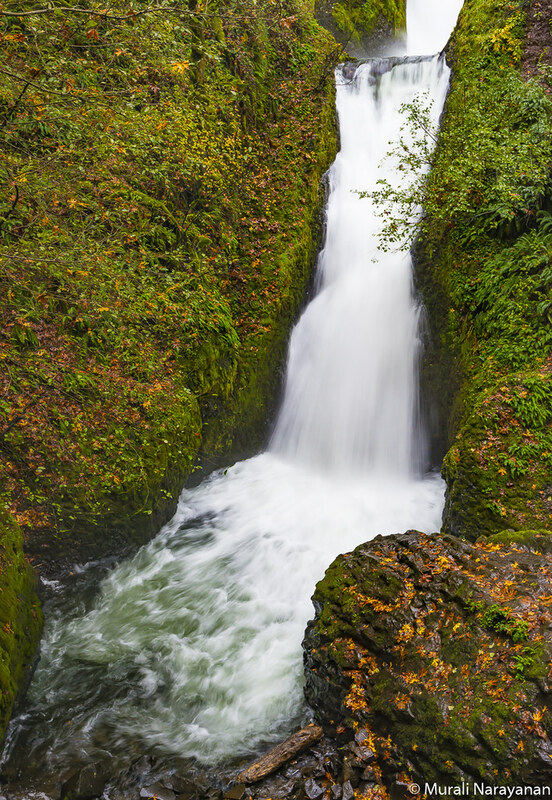 The falls is made of 2 stages – it begin with a horsetail which feeds into a plunge similar to the Ponytail Falls. The image below is that of the upper tier shot from the end of the short trail. The image below is that of the lower tier, a ponytail, framed by the autumn leaves shot from a spot bear the trail head next to the bridge over Young’s creek. I used a telephoto lens on a Nikon DX camera. It was past 5pm when we left the falls. Mutinomah Falls area was over crowded and we skipped it to hit the Bridal Veil Falls. There were no cars in the parking lot. The trail was 0.3 miles long with an elevation gain of about 75′. We hiked up to the viewing platform at the end of the trail and I shot the below picture from it. It was quite dark and I had to push the ISO to 500. We called it a day and checked into the Cascade Locks Best Western Inn. It started raining when we drove to the Washington side of the Columbia river to the Skamania Lodge in the town of Stevenson for a terrific dinner. After an early breakfast at the Bridgeside restaurant next to the hotel, we reached the grand daddy of the Columbia Gorge waterfalls, the Multnomah Falls at sunrise. It is near impossible to visit this waterfall and not let your jaw hang a little in awe of the sheer size of it. The parking lot was empty and we were the first to walk to the falls. It was drizzling a bit. The fall colors staring to peak and I felt we were a week early. We got a lot of good shots from the viewing area. We stopped at the Wahkeena Falls and the Horsetail Falls on our way to the Elowah Falls. 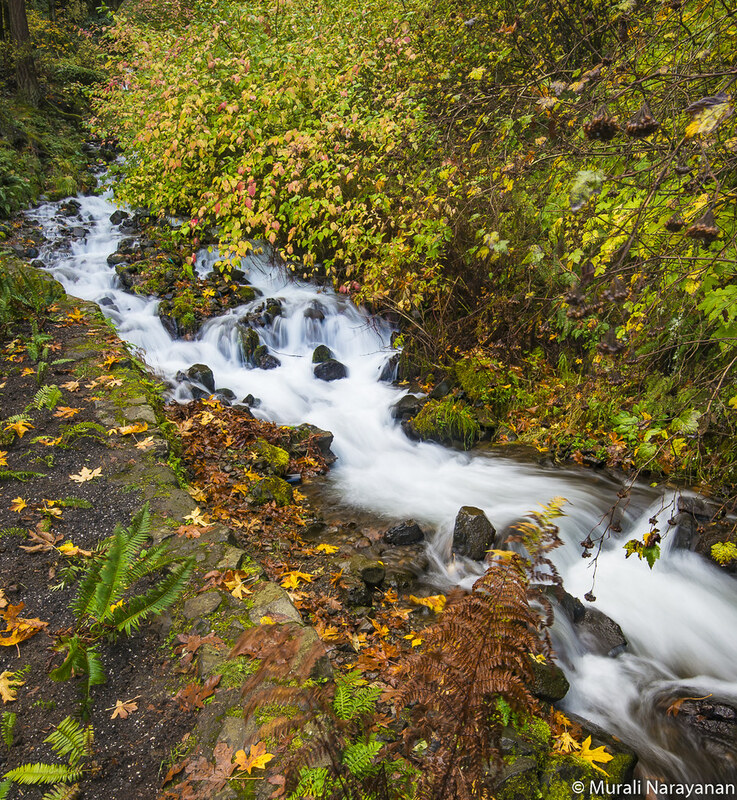 The autumn leaves by the side of the Wahkeena Falls caught my eye and I grabbed a shot. 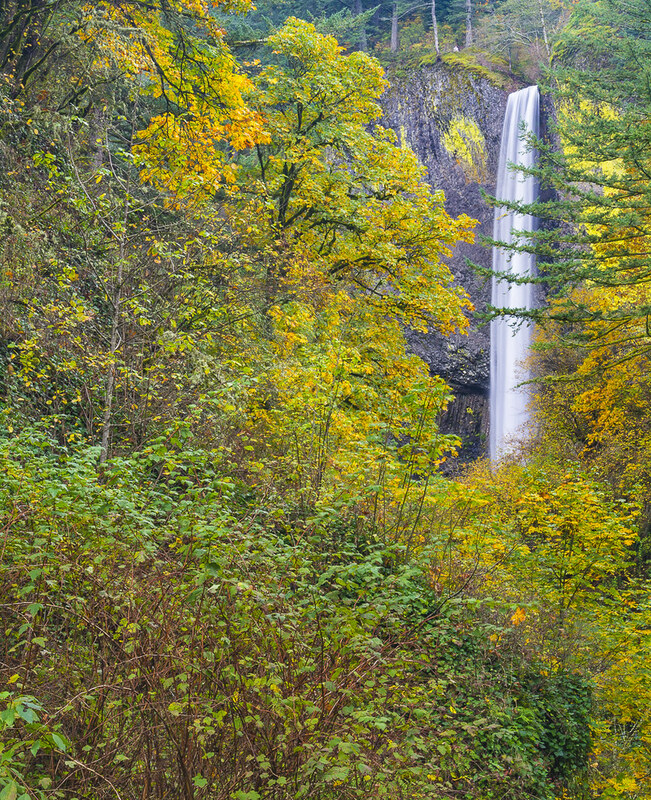 I also shot the fall colors on the trees in front of the Horestail Falls. We reached the John B. Yeon Trailhead at around 930am. The hike was 1.4 miles roud trip with an elevation gain of 280′ and it was awesome. The weather was pleasant and the trail was in terrific condition. The cliffs on either side of the falls are flanked with the colorful yellow-green lichen adding a lot to the aesthetics of the scene. After spending an hour photographing and enjoying the view at the base, we hiked back. We were not super hungry and so decided to checkout the fish ladder in the Bradford Island Visitor Center attached to the Bonneville Dam. On our way back home, we stopped for lunch at the Troutini restaurant in Troutdale.